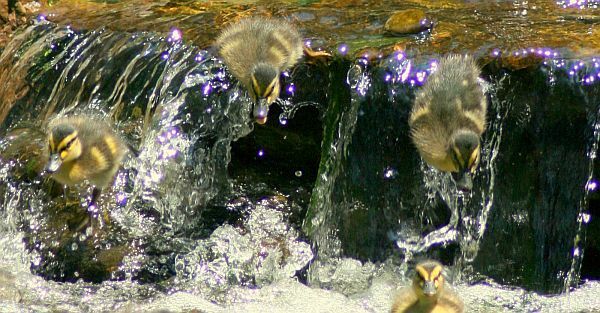 A pair of ducks adopted Sue Wehrman’s pond this spring and she shared her photos. They were delightful, so we asked if she’d be our September Pond of the Month. Since the ducks arrived, she’s done quite a bit of research and taken some wonderful pictures of them. 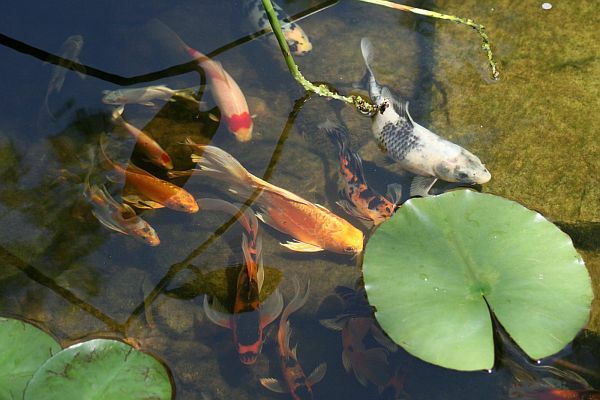 Sue writes: I started with a 220 gallon pre-formed pond. 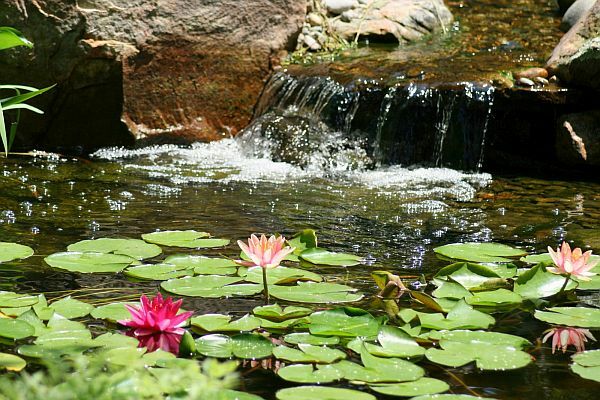 Then I went on my first Pond-O-Rama tour three years ago and decided that I absolutely HAD to have a pond like those I had seen on the tour. I was hooked. The pond was originally built by Pond Envy and was nestled under a very large pine tree (about 50 feet tall) on the hill. The rock bridge is part of the original design. Then, last spring, the pine tree began to die and was diagnosed with borers by a local arborist. So, it had to go. Now I was left with a very large pond next to a very large hole in my yard. I contacted a number of different contractors for ideas, and ended up with Chris Siewing of Nature’s Re-Creations. 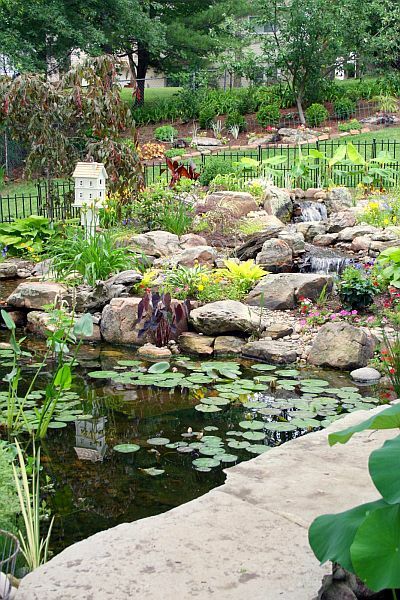 He actually redesigned the pond, added all the boulders, stream and waterfalls last September. As far as I am concerned his work is brilliant. I could not be more pleased. Everyone who comes to my house says the yard is like a resort. I am in love with my pond. I have koi, comets and mosquito fish, all of which I have bred and I’ve given away several babies from all. I’ve also put ‘Weather Loaches’ (or Dojo Loaches) in the pond, and they winter over. A pair of ducks adopted the pond this spring. At first, I was afraid they might bother the fish, but they absolutely do not. A pair scouted out the pond and hung out together for several weeks, and we named them Donald and Daisy. Then, when the female built the nest and started laying the eggs, they would only come to the pond to deposit an egg (one per day) and leave. What I’ve read says this is so they do not attract predators to the nest before she is ready to start sitting on the eggs. When the female completed laying all of her eggs, the male left and she started sitting. The one thing the ducks DO like is plants. They have defoliated A LOT of the plants in the pond. Just for info: they love water hyacinth, pickerel and water celery. They have not eaten lotus, lizard tail, cattails, taro or reeds, and they’ve just chewed the edges of the water lilies. They like variegated hostas, but not the others (go figure!) So they will take a toll on the plants, but I wouldn’t trade the experience of having them for anything. The plants will grow back. And they are not messy like geese, if you get my meaning. Supposedly, once they nest successfully in a spot, they return every year. So we’ll see what happens next spring.